The Center for Independent Journalism in Slovakia was founded in 1993 by the Independent Journalism Foundation (IJF) and was closed in December of 2003. IJF continues to offer the Roma Mainstream Media Internship program and helps its graduates to develop worthy projects which will enhance the twin goals of diversity in the media and a voice for Roma in the public forum. The following is a sampling of programs that IJF's Center for Independent Journalism ran during its ten years of service to the journalists of Slovakia. U.S. and Europe based partners included such as The Freedom Forum, European Journalism Centre, and among the local Slovak partners are the Open Society Fund, USIS, Friedrich Ebert Stiftung, British Council, Know How Fund, Citibank. Everything here knows an obvious progress. I appreciate a lot the efforts you've made and I thank you all for the warmth, the smiles, the kindness and the training you've given to us. Communication, integration, and education are the key elements of this project. The purpose of the programme is to provide opportunities to ten talented young Roma with at least a secondary education to develop careers in the mainstream media. It is designed for the students in the first to third grade and working for a student magazine or those who would like intend to start one. The workshop will take place once a week in the afternoon. Students will learn the basics of journalism -interviewing techniques, researching stories, developing sources, and writing stories. One-day workshop on Slovak language morphology, stylistics and syntax organized for journalists working for dailies, weeklies and news agencies. balanced reporting, and newscast structure. Tailored course on reporting, newscasting, developing stories, techniques etc. for regional and local TV studios. The first day of the course, attendees will be asked to develop a photo story idea with international publication in mind. The second part of a the seminar will involve the completion of a photostory - given them the first day of the seminar by the trainer – and completed by the end of the third day. This training is designed for the working reporters who are interested in learning and improving their English skills. 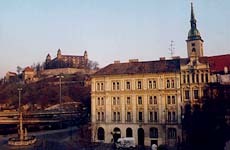 The agenda of the conference includes a thorough discussion of the new FOIA (Freedom of Information Act), which goes into effect in Slovakia in January 2001. Although FOIA has been passed, there hasn't been much public discussion of what this means for reporters who frequently have a hard time accessing government documents. Judges, reporters, and government officials will gather in Bratislava to discuss the implications of FOIA. The conference may also take on the road to Kosice. newspaper, radio and television is also taught. Canadian Fund. It is focused on definition of woman’s role in the media organisations, its impression and impact on decision-making position in the society in transition. Lecturers: Slovak and Canadian journalists and experts. Two one-day courses emphasis is to explore the relationships between the public administration, government and the media. It also includes a discussion of the new FOIA (Freedom of Information Act), which goes into effect in Slovakia in January 2001. Although FOIA has been passed, there hasn't been much public discussion of what this means for reporters who frequently have a hard time accessing documents from the public administration representatives. The serial of training offers to teach basic environmental reporting and writing techniques, introduce some of the new computer databases and other resources available to reporters and editors. what tools are available to help reporters and how to use them. process. How to prepare for an interview for newspaper, radio and television will be also taught. I've been very impressed by this course. I admire you greatly for the way you have to communicate with us, the trainees. broadcast media as well as current affairs. When ever possible, our Centers send experts to newspapers, T.V. and radio stations for one-on-one, concentrated assistance. Our experts from the U.S. and Europe -- often spend days (and sometimes even weeks) at a single newspaper, radio and T.V. station screening all aspects of the operation and, through consultation and written reports, comparatively tackle the existing problems. These can, of course, involve problems either on the news or business side, or both. These visits cover everything from budgetary problems to set highly improvements can be arranged by calling our Center.